Local leaders are clamouring for connection to a high-speed rail link between Manchester and Leeds, after chancellor George Osborne announced plans yesterday. Mr Osborne told an audience in Manchester that he was only ‘starting the conversation’ about the High Speed 3 (HS3) project, admitting that plans for the high speed rail connection have not yet been set in concrete. While emphasising that he only wanted the UK to ‘start thinking about’ the project, the chancellor said his proposed route should feed in to David Higgins’ review of the second phase of HS2. 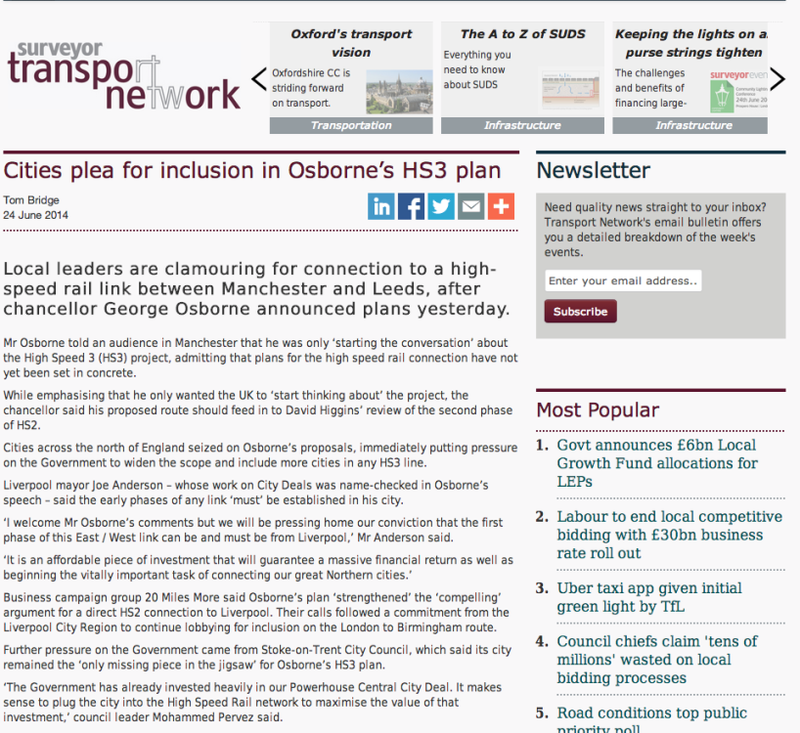 Cities across the north of England seized on Osborne’s proposals, immediately putting pressure on the Government to widen the scope and include more cities in any HS3 line. Liverpool mayor Joe Anderson – whose work on City Deals was name-checked in Osborne’s speech – said the early phases of any link ‘must’ be established in his city. ‘I welcome Mr Osborne’s comments but we will be pressing home our conviction that the first phase of this East / West link can be and must be from Liverpool,’ Mr Anderson said. Business campaign group 20 Miles More said Osborne’s plan ‘strengthened’ the ‘compelling’ argument for a direct HS2 connection to Liverpool. Their calls followed a commitment from the Liverpool City Region to continue lobbying for inclusion on the London to Birmingham route. Further pressure on the Government came from Stoke-on-Trent City Council, which said its city remained the ‘only missing piece in the jigsaw’ for Osborne’s HS3 plan. ‘The Government has already invested heavily in our Powerhouse Central City Deal. It makes sense to plug the city into the High Speed Rail network to maximise the value of that investment,’ council leader Mohammed Pervez said. Pervez confirmed he would be writing to the chancellor to reiterate the region’s plans for an HS2 station.